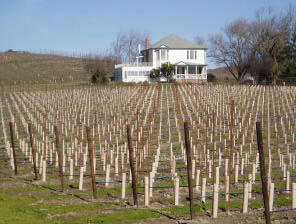 In the 1990s, Buena Vista was turning out 300,000 cases of ho-hum wine. They certainly were not on the pinotphile’s radar. Their best wine had become a Sauvignon Blanc made from grapes in Lake County, not from their extensive vineyard holdings in Carneros. 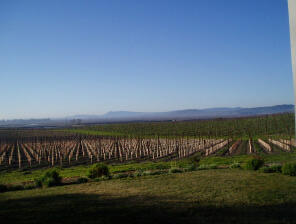 Top (ascending): new plantings, Buena Vista House for guests in background; view of new plantings looking southeast toward San Pablo Bay; Old vine; Bottom: fermentation tank room. irrigation and picking. 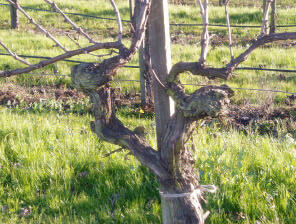 Better trellising and spacing of vines has been employed to stimulate balance and intensity. The emphasis is on farming for balance and quality now with lower yields in all vineyards (many blocks below 3 tons per acre), use of deficit watering regimes to create smaller berries, and the planting of natural cover crops to soak up water and add organic material to the soils. The current vineyard manager, Craig Weaver, is a Ohio native who has spent over 20 years managing vineyard sites in California. Jeff Stewart arrived at Buena Vista in 2003 after crafting cool-climate varietals at La Crema Winery in the Russian River Valley for five vintages. 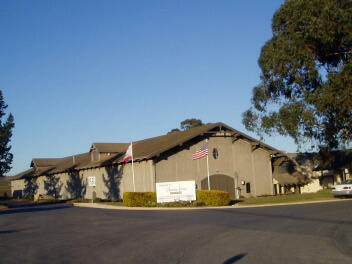 Prior to that, he made wine at Robert Keenan, Laurier, De Loach, Mark West and Kunde. 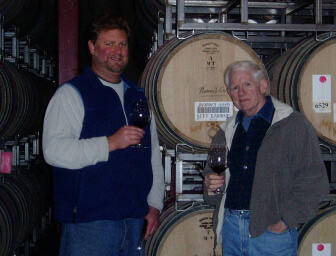 Noted winemaker Chuck Ortman was one of his earliest mentors. Jeff grew up in the Lake Tahoe area of California. His high school chemistry teacher encouraged him to go into winemaking after a trip to France in high school sparked his interest in wine. It was a bottle of 1978 Romanee-Conti that convinced him to make Pinot Noir. Jeff is like a big friendly bear - a burly guy with a winning smile and an unrelenting enthusiasm for his work. His mantra is balance and he says, “As with many winemakers, I believe in balance, both in the vineyard and in the wines. I like to see power and elegance working together.” In early 2004, Jeff and the Beam Estates management team headed by Jim DeBonis, made the decision to discontinue the previous California Classic and Grand Reserve lines of wines, and reduce production to 45,000 cases. The two new lines of wines include: The Carneros Series, varietal bottlings of Chardonnay, Merlot, Pinot Noir and Syrah ($19-$21) and The Estate Vineyard Series (EVS) of limited release wines featuring select clonal material and/or blocks from the property ($37). New packaging and labeling create a modern and sophisticated tone. The grapes here are picked in early morning hours, starting at 2:00 AM and finishing by 8:00 AM. The cold fruit that is brought in is fresh and sugars are slightly less than at mid-day. Intensive sorting is followed by de-stemming. 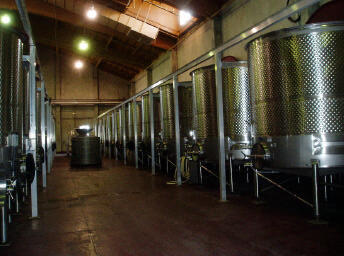 Fermentation is carried out with both native and commercial yeasts. A Revinsa basket press is used to gently draw off the juice. All of the blocks are aged separately using about 35% new oak (mostly French, some Eastern European). Currently there are 20 clones of Pinot Noir on 40 blocks across 180 acres. I recently had the opportunity to sample several of the latest releases of Pinot Noir. 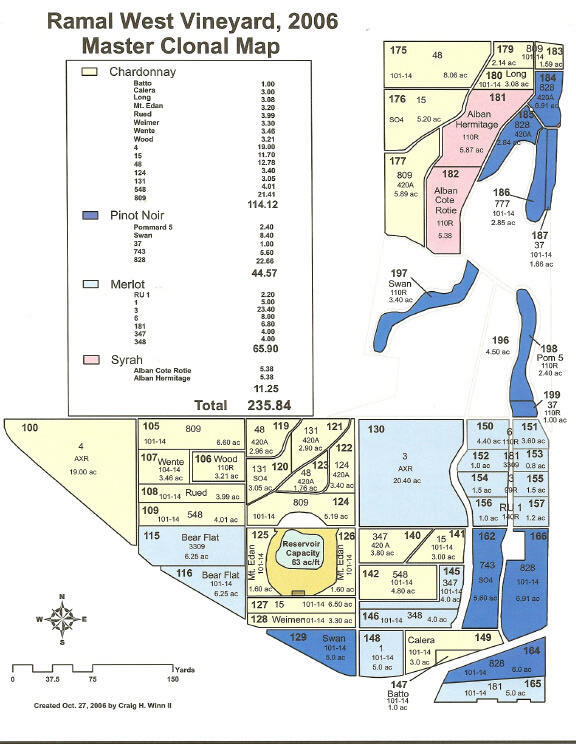 There is tremendous potential here because of the vast vineyard acreage upon which to draw. With the infusion of modern farming technology and skilled winemaking, the future looks very promising. By 2006, only 40% of the vineyards were producing fruit so the wines tasted below only hint at the future quality of the wines to come. All of the wines have nice finesse and weight. There is no t n ‘a overload and the wines are nicely balanced. Mouth feel is particularly attractive. Once Jeff has all of the right grapes to work with, his ducks in line as they say, Buena Vista Pinot Noirs will be on every pinotphile’s want list. Agoston Hereszthy would have been proud. 14.3% alc., 2,600 cases, $22. 9 vineyard sources. Grapes were 100% de-stemmed and fermented in individual lots. Aged 10 months in 35% new French oak with some Hungarian oak. Unfined and unfiltered. · Moderately light reddish-purple color in the glass. Initially the nose offers demure but satisfying aromas of red cherries and berries, dried rose petals and a hint of baking spice. The aromatic intensity fades over time in the glass with a touch of alcohol rearing up. Medium-weighted red fruit flavors with a nice smack of cherry on the finish. Very soft tannins and a smooth mouth feel make for easy approachability. A fruit-forward wine offering a glimpse of the 2009 vintage in Oregon which offers more upfront charm than the 2008 vintage and higher alcohols. Good. 13.5% alc., $25. · A light style of Pinot Noir that takes on a fuller structure with time in the glass. Attractive cherry, toast and smoke notes are featured in the aromas and flavors. A thoroughly satisfying daily drinker. 14.3% alc., $42. · A elegant Pinot Noir that is beautifully weighted. It rolls over the tongue like silk. Red and black stone fruits are featured with plenty of Asian spice. The balance is impeccable and the finish urges you to take another sip. The sensuality of Pinot Noir can be found here. 14.2% alc., $42. · The nose reminds one of freshly baked cherry pie but is rather closed at this time. There are interesting spice elements underlying the Pinot fruits. The wine is rather closed and not offering all of its potential charm. Some cellar time is necessary. 13.5% alc. 14,000 cases, $23. · An elegant style that is driven by cherries and strawberries in the nose and flavors. A little smokiness and herbs add interest to the nose and finish. This wine has a fairly rich mouth feel. With air time, the wine becomes quite silky and more fruity. 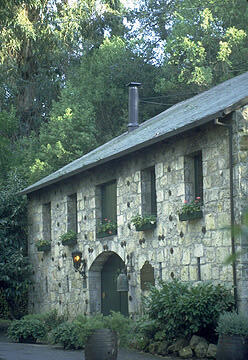 Buena Vista Carneros has a tasting room in the original winery stone press house (pictured below), located five minutes from the Sonoma Plaza Square. It is open from 10-5 daily and the phone is 800- 926-1266. 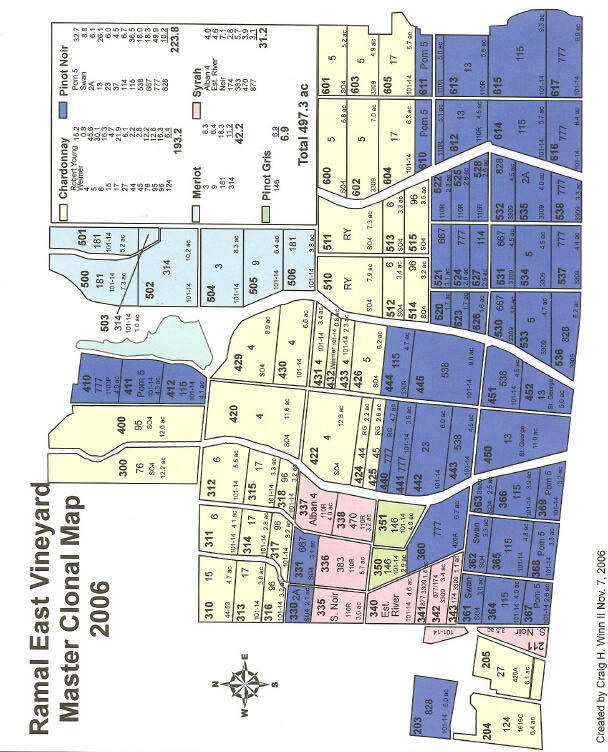 You can drive out onto Ramal Road and see the Ramal Vineyard and Buena Vista winery, but tours here are by appointment. 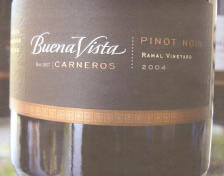 The 2005 Carneros Pinot Noir was released in December, 2006, but the other 2005 Pinot Noirs are not available as yet. The winery website is www.buenavistacarneros.com. Wines may be purchased on the website or through fine wine retail channels.